When James Barnett approached me with this infographic on investment, prosperity and financial management, I asked him for a supporting article to go with it. Really, one picture is worth 1000 words. However, I found his words to be worth 1000 pictures. note: Please be aware that this article is written by an employee of Pannone Law.I am not receiving any money to publish it. Family Life is often tied between the equilibrium of divided wealth and investment management, which correlates the success of ones ambitions, influencing manoeuvrability in a competitive capitalist society. The Circles of Life, managed through a professional and structured financial arrangement can provide incredible opportunity and the essential building blocks to provide future prosperity for your families aspirations. 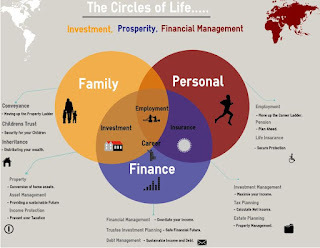 Employment features at the heart of life’s circle as it is the most significantly influencing factor for wealth creation and self-determination. It will often provide the financial means and investment opportunities in addition to becoming the source of generation for new relationships and lasting connections. Each career step, whilst layering responsibility within employment provides an external provision to invest in home assets and your family’s future. The company employing you is likely to offer various perks through insurance, pension and financial planning, or in some cases be an offset of your personal management should you be able to negotiate a better deal with private lenders and market players. The crucial elements to succeed within this financial cauldron lay within an understanding of the legal boundaries and market movements that controls the financial relationships within contemporary wealth management. Trust funds can be used through different accounts to provide higher interest, conveyance knowledge can provide you a successful property sale, and tax levels can be reduced whilst retaining a fair contribution to compulsory earnings through a successful knowledge of the legal requirements to manage your income. Financial management often comes to a peak at the time of retirement, which should remain a highly rewarding and dramatic release from years of hard work and planning across life’s evolving circles. Upon reaching this stage, maximising your investment return will allow you to kick back for a much needed break.